Gimli, son of Gloin, has taken time out of his busy schedule to personally review this article, and has subsequently approved of it. In fact, he found it quite humorous, and shortly thereafter stated: "Well, it tickled me like nothing has tickled a dwarf before!" "Come over here and face MAI AXE BITCHEZZ!" For those without comedic tastes, the so-called experts at Wikipedia have an article about Gimli (Middle-earth). Not to be confused with Gimli, Manitoba. Gimli the Elf-Fiend (born Son of Gloin of the White Hood, Son of Gróin the Family Jeweler, Son of Farin who was Borin again, Favored Grandson of Welsh Dwarf Náin II, Owned by Glóin the torchbearer who was descended from Durin the Deathless, who died during the first age) is a crazy dwarf *cough*midget*cough* best known for shouting LET'S GET PISSED!!!!!!!!!!!!!!!!! in public. Gimli the Elf-Fiend (Son of Gloin of the White Hood, Son of Gróin the Family Jeweler, Son of Farin who was Borin again, Favored Grandson of Welsh Dwarf Náin II ) was born circus 2879, during the end of the Second Age. His father was Gloin “Axe-Man to the Bag-Man” Durin, and his mother was a fifteen year old French prostitute named Náin with webbed feet. From the accidental merger of these two great Dwarvish lines Gimli fell, wide and strong, like a newly-forged axe. And axe and axe he did. At the tender age of 150 he axed his father if they could go elf-hunting, and his father acquiesced. To the woven woods of Elvenhome they quickly went with stomping feet, and about them fell the ghost-white trees and elven rangers bitching. While quite a young human being (who later became a dwarf), (they called him 1/8 pint) Gimli was quite unhappy. He wasn't old enough to join the Guards, nor was he dirty enough to reach his shoes. Both of these things made him bitterly unhappy, but worst of all was his inability to reliably tell the difference between his mother and father. After being reprimanded repeatedly for calling his father by his mother's name, Gimli became surly and short-tempered, and referred to everyone as “Sir”. While these things made him downright unpleasant, even more infuriating was the fact that he was so short that his balls constantly scraped on the ground. As one might expect, Gimli wasn't a happy child. At the age of 8 Gimli took the Tyne and Wear metro to Barnes , home of Dwarves and it was there he became addicted to the Class B drug known as Wispa ( a chocolate bar) that all Dwarves claim to love. He was married to Kate Moss for a time and eventually divorced her and went to rehab with Amy Winehouse. He managed to get clean but Miss Winehouse is still on drugs. Indeed in her song "Rehab" the people who tried to make her go to rehab are in actual fact meant to be Gimli, his mother and his brother, Jerry Sienfeld. Lucky to survive this experience, Gimli went on to become one of the most feared and respected dwarves beneath the Blue Mountains. After Gimli was banned from Eriador in late 3016, Gloin decided that he needed to turn his son loose upon the world. As a flier for a multi-racial conference in October of 3018 had just been pitoned to their door, Glion thought that it would be good to send Gimli to it. Gimli wasn't pleased, but after being promised by his dad that ore, beer and visibly females dwarves would be there, he set out for Rivendell. Gimli became a dwarf after he had watched the movie "An Inconvenient Tooth" An epic tale depicting a Dwarven dentist who was viciously oppressed by the elven warlord Elvis Costello. He then felt sympathy for the dentist and then became a dwarf. One of the biggest elven-hippy-fests since Woodstock, Rivendell was a true lovefest. While dwarves weren't normally invited, the “exotic strippers” tent in Woodstock had been such a success that the elves invited everyone to their next event. Elven, Human, Dwarven, Halfling, Maia – all were invited and all made their way to Rivendell, billed “Woodstock with Trees”. Elrond once again prepared his “magic kool-aid” and held the ever-popular “story hour” every hour, on the hour. While at Rivendell, Gimli met Frodo, a half-half-elf of minor nobility. Born Phineas Taylor Barnum, Frodo was known throughout the lands as the Lord of the Rings. Ensnared by the elvish women, wine, and weed, Gimli decided to follow Frodo on a mystical journey to “find the rocks in my soul”. Too high to swing his axe, Gimli instead befriended Legolas, an elven member of his traveling party. 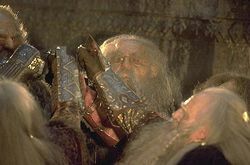 After jointly handing out leaflets in the parking garage under Moria, Gimli and Legolas flew to Lorien where they “felt and tasted the music”, hit on the chicks and bought some souvenirs. Deciding that “Smoking Mountains are lame, yo”, Gimli and Legolas quit Frodo's company and instead wandered over to Rohan to see the horsies. After briefly riding around the open plains, the now-inseparable pair visited Helm's Deep for a little R&R. Bored with the lack of activity there, they left to see the famed Tower of Isengard, two days before an orcish army sacked and burned Helm's Deep. Reaching Isengard, they were dismayed to find that it had been mostly burned down and flooded, and was a shell of its former glory. However, they found floating in the flotsam a crate of the finest weed, and bumming a pipe, they smoked up and chilled for a few days. While this might seem idyllic, it was at this point that Gimli's famous rage took over, and he decided that he was sick of everything going wrong in his life. Upset that a regional warlord named Sauron had sacked Helm's Deep after they had left, Gimli rallied an army of a few hundred thousand dwarves, elves, and men and headed over to Sauron's place to have a chat. While this wasn't the root cause of his unhappiness, it was a convenient excuse. Through sheer coincidence, Sauron had been feeling pretty unhappy as well, thus the vast army and the pillaging. Not satisfied with the lack of resistance at Helm's Deep, Sauron set out for Gondor. As the two armies passed each other, nobody on either side said a word. Both felt terribly awkward, and when Gimli and Sauron passed, they both said “Hey”, avoided making eye-contact, and quickly kept going. After pillaging each other's places, Gimli and Sauron again passed on the way home. Neither commented on the other's hat. During his fall gimli apparently had a gay spell in where he was the only gay dwarf in the village. Luckily Sauron went on Holiday, or it would have been bad for Gimli. Unfortunately, Legolas was a diehard elven hippy, and abhorred violence. While he liked Gimli, pillaging wasn't his thing, and this started to drive a wedge between the two of them. This bickering soon began to undermine Gimli's authority, and his army began to disintegrate around him. Even worse, tensions were mounting between Sauron and Gimli once again, and this time, it looked like they might need to “meet at Morannon at noon” to settle the dispute. Luckily for Gimli, it was at this time that Sauron decided to go on holiday, sparing him the shame of being unable to muster an army. As his army had deserted him and Legolas was still being bitchy, Gimli decided to go home. He went back for a bit, but still couldn't tell the difference between his mother and his father. His room was way smaller than he remembered it, and the rocks all tasted the same. Leaving for the second time, he looked up Legolas again, who, by now, was at another concert in Lorien. However this concert sucked, and Legolas asked Gimli if he wanted to go on “The Ultimate Road Trip”. Gimli was more than happy to hit the road again, so they packed some grub, rolled some joints, and headed west. It was like a pilgrimage to Mecca, only without the dying. Days later they hit the mouth of the ocean, and Gimli saw what Legolas had in mind – a little skiff lay tied to a pier, with a couple more elves smoking reefer sitting around it. “This is it”, said Legolas, “Our one-way ticket to the land of milk and honey.” They raised their sails, dropped some acid, and were never heard from again. Gimli never died. In fact, he is still living in wigan. He killed death with his companions Tupac Shakur, Mr. Rogers, Collin Leach, and Ferris Bueller. He also later appeared in the book Teh Bibel written by Lee Harvey Oswald and Richard Nixon during the Great Depression. But now he goes by the name Maureen and goes to a college near by when the portal from middle earth opens. Sometime during the nether-century, Gimli-Maureen grew tired of his once very good friend Legolas. So he moved to sweet home alabama. He then moved back to wigan becuase he likes pies. During September 2009, Gimli was convicted of killing a poor incent mouse, commonly mistaken with a moose, in Wigan park. 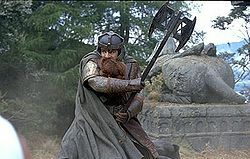 Gimli protested his innocence, and upon going to court he was cleared of the murder due to the jury being killed or paid off. Everyone knows he did kill the mouse. He is also currently undergoing charges of drunk driving, though the ticket was given under the name of Maureen Baxter. Gimli has developed a liking for the Power Puff girls, some says he's bought nearly every power puff product. He also loves mojo jojo. This page was last edited on 8 October 2012, at 23:57.